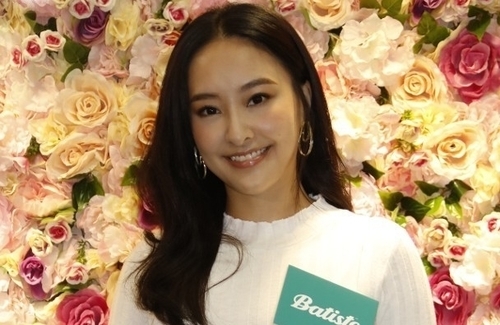 Life on the Line <跳躍生命線> actress Jeannie Chan (陳瀅) attended Batiste’s dry shampoo promotional event today and disclosed she doesn’t like to wash her hair. Not afraid of tarnishing her goddess image, the 29-year-old revealed she did not wash her mane for six days until this morning. However, six days is incomparable to her highest record of 10 days. It occurred during the wintertime when she went to Moscow to film a travel show. As the area she was staying at was very secluded and the water pressure was not strong enough, she forwent washing her hair. Moscow’s cold temperature also helped keep her hair non-greasy. Aside from the dramas keeping her from washing her hair, they are also preventing Jeannie from going back to Vancouver for Christmas this year. However, she hopes she can go visit her family in January in the following year. That’s gross for not washed her hair for that many days? Boy if I don’t washed my hair for many days my hair will be greasy and itchy and smells too. She’s the same things as Priscilla Wong I remember she doesn’t like to wash her hair that much too. If she thinks she don’t have time to take care of her hair then cut it very short like a guy that way it’s a lots of easier to wash them and blow dry. @wm2017 Lol. I know what you mean. Whether it is gross or not, you have to admit she is brave to admit it instead of lying and attempting to hide it like many who have plastic surgery. Is her hair that thick that it takes her that long to blow dry it? I just leave my hair to dry and it dries after awhile. Fan Bing Bing admitted to not washing her hair for 10 days. Ming Dao admitted to not taking showers or baths often as he did not like it. I must say that these celebs are very brave. I would be embarrassed to admit things like this to the public. @hetieshou I’m like you don’t like to blow dry my hair either because after that my hair are very puffy I don’t like it so I just let it dry by itself too. I have noticed Fan Bingbing has a very long hair at all the time so I’m sure her hair takes lots of time to take care of it. I don’t know who’s that person is you’re talking about not like to take a shower or bath but I think it’s disgusting I’m sure people will smell you bad for not taking a shower often unless they’re wearing a lots of perfume to cover up those smells scent. Lol. Still can’t imagined. @cutie777 she is not ashamed for saying that? i’m amazed! if it takes too much effort to look after long hair, cut it short. I totally agree with you. I pity the artistes who have to work with her. yucks! @janet72 Lol. I know right? @cutie777 actually if you use dry shampoo in between, eventually your scalp will stop producing so much oil. My hair used to get oily after 1 day of not washing and that’s because I wash it everyday. Then after my friend advised me of not washing it so often I used dry shampoo in between washes and was able to extend it to 4-5 days before my hair starts to look oily. Admittedly it was very itchy in the beginning but eventually your scalp gets used to it. Also they might be spokespersons for shampoo companies so they can’t just cut it short. At least I think Priscilla Wong is.